Being counted amongst the well acclaimed names of the industry, we are into offering Lip Pouring Ladle. 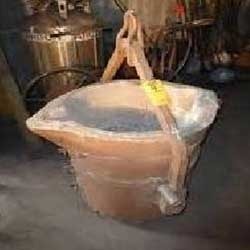 Our product is utilized for pouring molten metal. These products have mounting blocks located on each side of a pour spout. The products that we offer are used for independent and alternate attachments of the ladle to permit pouring of molten metal from the ladle on an axis falling through the lip of the spout. The offered products are admired for their superb quality. In addition, these Lip Pouring Ladles have competitive rates. Technotherm Projects Pvt. Ltd. conceived its business in the year 1993 as an Engineering organization of the industry. We were established as a PrivateLimitedCompany at Kolkata, West Bengal (India). We are the manufacturer and supplier of Electric Furnace, Heating Kiln, Electrically Heated Oven,ProcessEquipment and many more products in the list. We have successfully executed several projects in structural, piping, capital equipment fabrication and erection as a contractor as well as turn-key contractor for different projects. We also offer RepairingService for our entire product range. With our excellence in service and years of industrial experience, we have created a big list of clientele and offer them their varied range of products as per their demands. We assure quality of our products and also ensure that they will give hassle free performance to the user. We deliver our assignment via road or via cargo as per the client convenience.